Sutton Park has an extensive history. Part of a major Roman road, Ryknild Street, runs through the west of the park. Mentioned in the Domesday Book, the park can be traced back to at least the 9th century, from which time its status alternated between Royal Forest and Chase. In the 12th century it was a mediaeval deer park. 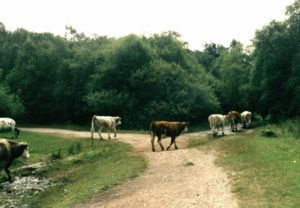 In the 16th century, the site provided wood for the people of Sutton Coldfield and the land provided grazing for their animals. From then until recently, grazing has been an important feature of human use of the park. In recognition of its long history of human use, and the quality of many of its archaeological sites, particularly the mediaeval deer park boundaries, large parts of the park were declared a Scheduled Ancient Monument in March 2002. Burnt mounds -- prehistoric mounds of heat shattered stone which is the debris from steam bathing or cooking. The Roman Road -- a well-preserved stretch of the Ryknild Street, built in the first century AD to connect two forts in Edgbaston and Wall. Mediaeval deer park boundary -- the ditch alongside Streetly Lane, Thornhill Road and Chester Road North. There was a bank along the outside which would have had a high fence on it. This feature dates from the 12th century. Sub-divisions of the mediaeval deer park -- banks and ditches running through Lower Nut Hurst and alongside Holly Hurst, and north of Bracebridge Pool. Mediaeval fishponds -- Bracebridge Pool, Keeper's Pool, Wyndley Pool. There is a dam at each and a quarry from which the material for the dam was taken. 16th century coppices enclosed with banks and ditches -- Streetly Wood, Darnel Hurst, Pool Hollies, Upper Nut Hurst, Lower Nut Hurst and Holly Hurst. Created to exclude grazing animals. 18th century mill pools -- Longmoor, Powell's, Blackroot. They have dams and quarries. A walk starts from the quarry at Blackroot Pool. 19th century military targets from when the park was used for military training. For further information contact the Visitor Centre or see Michael Hodder (2013), The Archaeology of Sutton Park. Little is known of the history of the park prior to the Roman period. After their conquest of Britain, complete by about 80 AD, the Romans built a network of roads connecting cities and forts. Two of these roads crossed at the fort of Etocetum (the site of the present village of Wall, north of Sutton Coldfield). The east-west road is the basis of the modern A5. The north-south road ran from the Cotswolds northwards through what is now Sutton Park. For about a mile and a half (2.5 km) in the park, there is one of the best preserved sections of Roman highway left in Britain. When the Romans left and the Anglo-Saxons drove away the native Britons, the kingdom of Mercia was centred around Tamworth. St Chad, patron saint of the diocese of Lichfield, converted the last pagan king in 765. Sutton Park was part of an extensive hunting area, or chase, to the south-west of Tamworth. 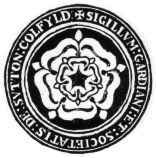 The name "Sutton Coldfield" appears to come from this time, being the "south town" (i.e. south of Tamworth and/or Lichfield) on the edge of the "col field". "Col" is usually derived from "charcoal", charcoal burners presumably being active in the area. After the Norman conquest in 1066, the woodlands of Sutton were recorded in the Domesday Book as being two miles by one mile (about 3 km by 1.5 km). They formed a very small part of the great forest of Kank or Cannock, which was the private property of the king. In 1125, King Henry gave part of this forest, Sutton Chase, to the Norman Earls of Warwick. In 1126, a deer park was constructed in the Chase; this formed the nucleus of what later became Sutton Park. In 1419, the Earl of the time let the manor house of Sutton to Sir Ralph Bracebridge, who built the dam which forms Bracebridge Pool. Like Keeper's and Wyndley Pools, constructed in the same era, the purpose of Bracebridge Pool was to provide fish for the table, particularly during Lent. The 'Warwick period' came to end when the Earl ended up on the losing side in the Wars of the Roses, and his estates were forfeit to the King after his death in 1471. [D]uring all these years and for long afterwards, the gentry of the neighbourhood did well for themselves with the revenues of Vesey's lands, and elected each other, with neighbourly fairness, to share the spoil. In 1778, a member of the Corporation, Sir Joseph Scott, supported by the rector, his curate and some 87 of the town's landlords, proposed enclosing all the common lands of Sutton, including the park, and dividing them among the landlords of the neighbourhood. Following the protests of the townspeople, the Corporation rejected the proposal. However, in 1825 most of the common land was finally enclosed, fortunately excluding the park. In 1826, Sir E Hartopp -- one of the principal beneficiaries of the earlier enclosures -- was allowed to acquire "the Ladywood" for his park at Four Oaks in exchange for the meadowland around the Sutton and Boldmere Gates. This exchange explains the 'bite' out of the north-east of the park between the Four Oaks and Hartopp Gates (see map). A railway line was built through the park following a House of Commons bill of 1872, to considerable local opposition. The railway, which had reached the town of Sutton Coldfield in 1862, allowed day trippers to visit Sutton Park, which grew in importance as a site for leisure activities. During the second half of the 19th century, there were two horse racing tracks, two golf courses and a Crystal Palace with a fun fair, as well as swimming and boating on some of the pools. The park was used for military training during this period, and a firing range was established in the Longmoor Valley. The remains of the military targets can still be seen by following the Longmoor Valley Walk. The Warden and Society disappeared in 1883, and a 'modern' town corporation was set up, followed by an elected borough council. The park was used for military purposes in both the First and Second World Wars. 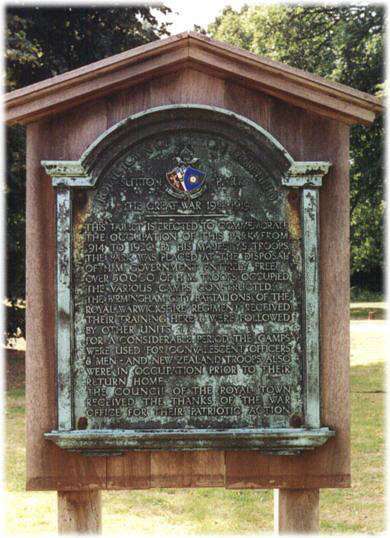 The tablet shown below was erected by the Borough Council of the Royal Town of Sutton Coldfield, to commemorate the use of the park in the First World War of 1914-19. The tone of the wording suggests that its main purpose was self-congratulation on the part of the Council. 1914 to 1920 by His Majesty's troops. of H.M. government entirely free. Office for their patriotic action. 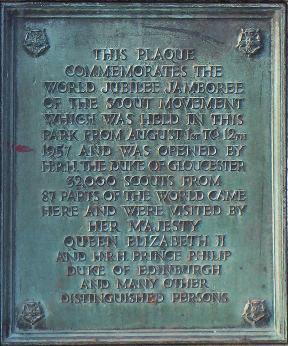 In 1957, the Scout Movement held its World Jubilee Jamboree event in the park, with camps set up for some two weeks. The 'Jamboree Stone' was erected to commemorate the event. It states that there were 32,000 scouts from 87 different parts of the world. Both military use and the Scout Jamboree unfortunately left behind some damage to the habitats and wildlife of the park. Other threats did not wholly disappear along with the Warden and Society; the Friends of Sutton Park Association was founded in 1950 to oppose the building of houses on parts of the park. The , founded in 1919, was also involved in opposing some actions of the Borough Council. For example, in 1968, the two societies and the Sutton Coldfield Civic Society protested vigorously over the way in which Little Bracebridge Pool was dredged. In 1972, Sutton Coldfield became part of Birmingham City, whose Council has since had the responsibility of managing the park. The park's current status as a Site of Special Scientific Interest (SSSI), National Nature Reserve (NNR) and (in parts) a Scheduled Ancient Monument should mean that it is now safe for the foreseeable future. For further information about the history of Sutton Park contact the Visitor Centre or see Michael Hodder (2013), The Archaeology of Sutton Park.